Fringe is all the rage this season - seen on necklaces, bracelets and earrings. With just a few simple materials and tools, you can create your own dazzling beaded fringe earrings that will be perfect for your holiday wardrobe. This design features Toho Seed Beads strung on 1 1/2" head pins and then attached to sterling silver chain by using round nose pliers. Use flush cutters to trim excess wire from the head pin. I love using the pre-mixed Toho Seed Beads because I like the random look of the different size and different colored beads. The beads can be strung onto the headpins in any order and all the dangling "fringe" will blend together. Feel free to string your beads in a predetermined pattern, this will give it a more formal and refined look. 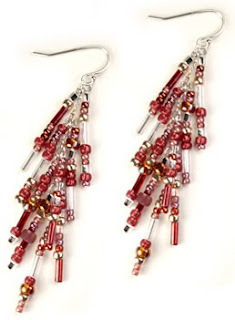 Each earring has 9 beaded head pins, but you can add as many as you wish. You can also experiment with different size head pins. For extra sparkle, throw in a few Swarovski crystal bicones. Buttons are just as bountiful and beautiful as beads, which you will discover if you visit the many button and trim shops in New York's Fashion Center. On my most recent trip to NYC, I discovered these pearly flower like beads and imagined them dancing on a two strand bracelet - I couldn't wait to get home and make something with these buttons! I chose Swarovski pearl beads to match the shimmer of the buttons. The neutral colors don't compete with the bold color of the buttons and allow them to stand out. The addition of Czech glass beads in matching neutral colors gives the piece just enough sparkle and enhances the elegant styling. This color combination was inspired by the frosting on yummy cupcakes from Magnolia's Bakery! I love using the tube clasp on multi-strand bracelets because of the simple, elegant shape which does not distract the eye from the focal elements of the bracelet. Showcase the perfection of Japanese Miyuki Cube Beads by creating this two tone cuff bracelet. 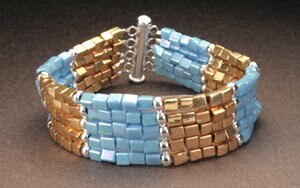 The cube beads fit together nicely to create geometric color blocks along the length of the bracelet which is finished with a simple tube clasp. I chose an opaque turquoise blue and gold for my bracelet, accented with sterling silver 5 strand spacers that look like sterling silver rondelles. The spacer bars are not only functional, but mark the beginning of one color and the end of another. This is a simple way to create a bold look that is not overdone. Feel free to experiment with other color combinations or other types of beads. If you are ever at a loss at finding the right center piece or clasp, you can broaden your options with buttons. When I saw this button, I just fell in love with it - the golden shimmer and the blue detailing of leaves. I felt it best to use this button as a focal point with simple, but elegant white pearls. Buttons can be strung with beads or transformed into a clasp, in this case, I created a clasp with this beautiful button. The button did not have a shank, so I had to create one by wire wrapping a loop using gold filled wire. After creating this loop, the button could be attached with a crimp, just like any other clasp. For the other end, I created a loop for fastening the button, using 11/0 seed beads. Since the button is 22mm in diameter, I strung 44mm worth of seed beads and added 4 more to account for the thickness of the button, this gives it just enough slack to slip around the button. Since the button fits sideways through the loop, it is unlikely that it will slip off. When strands of the Borakku Black Toho Seed Bead Mix are braided together, a rich textural rope is created. 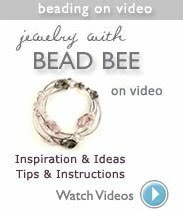 This is a simple technique for creating modern and innovative pieces of beaded jewelry. 2) Create several necklaces at various lengths that can be layered together or worn individually, the necklaces can be the same color, or choose several coordinating colors. You don't have to stick with seed beads, experiment with different size beads as well as different materials like suede, chains, leather, silke or satin. Add interest to your chains by incorporated a mixed palette of materials. 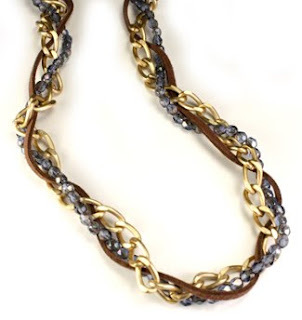 It can be as simple as braiding strands of gold chain, Czech glass beads and suede cord, as I did in this example. If you want more embellishments, add dangling crystals or pewter charms. It's such a simple idea that makes a big statement. To finish this look, create a matching Braided Suede Charm Bracelet. Bangles are fun to wear and simple to make. This example features Toho Seed Beads in the Sea Green Mix which contains various seed bead shapes in shades of green. The multiple coils show off the simple elegance of Japanese seed beads. Using Memory Wire: Memory wire maintains its shape on its own and clasps are not necessary. Memory wire cutters or parrot beak cutters will be required to cut the memory wire, other types of cutters will be damaged by the memory wire. Once you cut the memory wire, curl one end to create a loop which will prevent the beads from slipping off. Then thread the beads onto the memory wire, curl & loop the second end to finish. 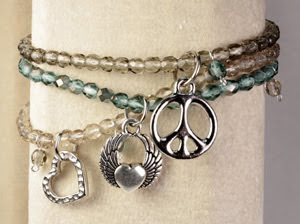 Charms can be attached to the loops on the ends or at different places along the length of the bracelet. It is such a great place and I found so many great things to incorporate into my jewelry designs. I had the chance to visit lots of bead shops, button shops, trim stores, hardware stores, and indulge in other sweet things (like cannolis and cupcakes!). We also stopped at my favorite pizza place in Times Square, a place I discovered while living in the city many years ago. Since I live in Florida, it's always nice to go up north and see the autumn flora and fauna - Central Park was gorgeous! I also visited the Swarovski Crystallized Store on Broadway, it was spectacular to see all the crystal beads on display. Take a look at previous posts and future posts for all the ideas that I came up with while on my trip. I always enjoy collecting neat little tokens from different cities and incorporating them into a special piece of jewelry to remind me of the great memories. 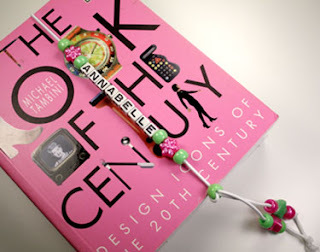 Vintage baubles can be created from modern day treasures. You can find vintage inspired components at your local craft store to incorporate into your jewelry. On my most recent trip to NYC, I discovered vintage style buttons adorned with Swarovski crystals, perfect for a string of pearl beads I had been saving. I created a vintage style necklace using this vintage style button with a string of pearls and added rosaline Czech crystals dangling from sterling silver chain. Use wire wrapping technique to attach the button at the shank to the pearls and chain. Beading is a great hobby for all ages because you can start simple and learn as you go. It is as easy as selecting a few dozen beads and stringing the beads on stretch cord and tying a knot. Don't forget to buy a set of bead stoppers. These are little springy clamps that you clamp onto one end of your string so the beads don't fall off while you are stringing. 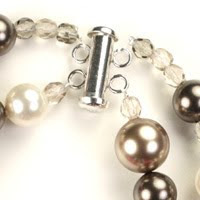 If you would like to finish necklaces and bracelets with a clasp, use flexible beading wire such as Flex Rite or Soft Flex, sterling silver crimp beads and a crimp tool. You will also need a flush cutter to trim any excess cording. Directions are usually on the back of the package for the crimp tool, or you can click here to get illustrated crimping instructions from our website. If you need more advice, give us a call! 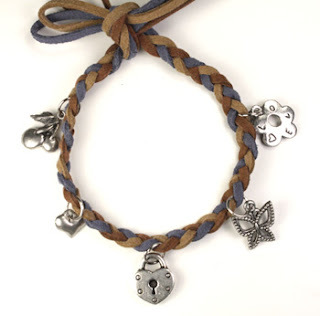 Incorporate charms into a more casual, softer look with braided suede. With thousands of charm options available, you can choose charms that fit your personality. Not only is this look simple to make yourself, it is easily personalized which makes these bracelets great as gifts. Attached charms with jumpring to the braid, the size of the jumpring will depend on the thickness of the braided strand. Be sure to use a large enough ring that will allow the charms to dangle. Bracelets can simply be tied around the wrist - these are so fun! As fashion is ever evolving so are the rules. Mixing silver and gold is now perfectly acceptable and mixing these two colors together can freshen up your look. By combining different metals and beads you can create an amazing necklace or pair earrings that break this once fashion faux pa.
A third, neutral color can easily tie gold and silver together. Natural stones are preferred such as smoky quartz or freshwater pearls. This third element doesn't have to be a neutral, you can add a deep, strong color that will work well with both gold and silver. Deep purples, blues, greens and magentas are nice options. Take a look at our example, strands of gold and silver Miyuki cube beads, adorned with silver charms and deep purple tone of Czech machine cut crystals. Multi-strands bracelets are such gorgeous designs and simple to make. Yet, many times, depending on many things, such as stringing materials, the types of beads and clasp, the strands splay apart on our wrist, ruining the multi-strand effect. This issue can be solved in may ways. For hard to tame pieces, add multi-strand spacer bars throughout your design which will physically join the strands together, 2-3 spacer bars should suffice. 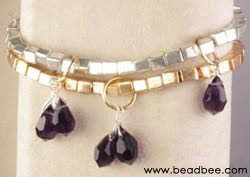 Seed beads are a great alternative to creating length which adds more color and texture than gold or silver chains. 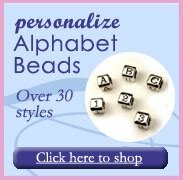 They come in a variety of colors, shapes and sizes and creating necklace or bracelet using seed beads is easy and fun. Make your own stylish, long necklace using seed beads to build length and larger beads as focal points or to create dimension. 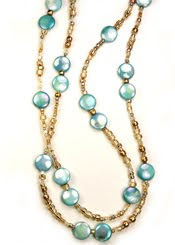 Our example features the Kintaro Gold Toho Mix and mother of pearl shells dyed to a gorgeous aqua color. 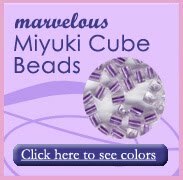 Seed beads are also great with Czech Glass Beads, gemstone beads, pearl beads or wood beads. Materials List: your choice of beads, flexible beading wire, crimps, clasp & findings, crimp tool.